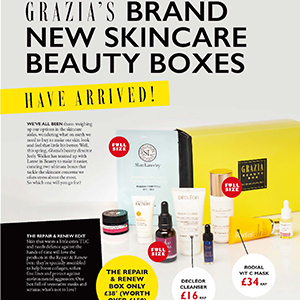 Grazia has partnered again with Latest In Beauty to launch the pretty new beauty boxes this time focused around skin beauty. Whether Grazia’s readers are in need of that ultimate glow-to-go or helping their skin to repair and renew, they can find Beauty Director, Joely Walker’s, curated edit of the very best products to help skin woes this spring. Through the Grazia website, all the readers were able to request and choose their beauty box, included many products in full size, at a very special price!